About twenty years ago (June 22nd, 1996 to be exact) Robert Winder contributed a review of the English essay tradition in The Independent. No one will remember it, so I’ll take the liberty of leaning on it for salient points relating to Andrew Sant’s recent collection – which happens to include a couple that made it into Best Australian Essays for the years 2010 and 2011. Sant is well aware in his introduction that what we’re used to nowadays is ‘the article’, and he has a traditionalist’s reluctance even to call his own works ‘essays’ – I assume because genuine old-style tub-thumpers contained solid elements of polemic, even of risk. Sant is a modern, but the essays offer strong arguments while also taking a few risks. 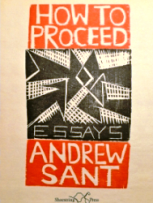 Andrew Sant has a number of poetry collections, including two Selected Poems – one in the UK and one in Australia – and he seems to have lived or travelled everywhere. His cheeky title, I imagine, alludes to self-help books or advice manuals (to the level of which some believe the essay has now sunk) and he describes his collection as apparently offhand, informal, digressive and unashamedly persona’ – but it’s clear he’s decidedly ‘into’ the task for its own sake. He has one eye on Charles Lamb’s ‘Essays of Elia’ which he quotes: You may derive your own thoughts from others; your way of thinking, the mould in which your thoughts are cast, must be your own (On Discovering How to Proceed). It’s in this essay that Mark Twain’s chaotically lively autobiographical methods are extolled, and it proceeds into a series of digressions about maps, Ireland, travel and an experience in Malta on the day Australia was about to decide whether to become a republic. So there are few straight or predictable lines being taken for a walk. …the big-picture view that rampant consumerism, now driving the UK economy not quite fast enough, is ill-suited to the speed with which the finitely-resourced planet….can recover from the consequential environmental degradation to which consumerism contributes. This is then presented as part of an argument for the recycling function contributed by Charity Shops. All of which leaves me thinking of this delightful journey as, in form and trickery, let me see…like a poem? These are emphatically not poetry essays but they can be read and appreciated for their poetic forms. The next up, I was delighted to find, is a homily to collecting: no doubt an obsessive desire to have absolute personal control…a hedge against chaos, a bulwark against death even though the subject of the essay is ‘On Only Children’. This one reveals a surprisingly harsh recollection of the author’s father who called him ‘selfish’ for spending competition prize-money on himself. The glimpses we get of childhood are mostly painful. Winder’s article tells us that ‘Essayists are preachers, but also the stand-up comedians of Literature’ and that ‘nearly all essays start out as something else’. There’s a sense in which these assertions have become irresistibly true in recent years. Clive James might spring to mind, and, more recently, some of the TV comics who often prove able to turn a good phrase or two – and on a wide range of subjects. In Sant’s collection there’s little preaching and no poetry essays, though one on Lawrence appeared in Tony Roberts’s Shoestring anthology Poetry in the Blood, and a couple of appendices touch on the day-job. Even the Lawrence piece is memoir, recalling a quest to be where the author had lived or written and in effect fulfilling it – no mean feat when DHL stayed (briefly) nearly everywhere. A very strong affinity, almost of a disciple, is described. A visit to Peter Porter during the 1970s is recalled (‘On Taking Risks’) in which the suicide of Porter’s wife and the author’s mother are seemingly casually touched upon but which clearly led to a friendship that existed beyond shared nationality. The two most deeply personal essays are, as it happens, those in the annual anthologies. ‘On Marriage’ is a painfully moving account of his parents’ marriage, his mother’s suicide and the fact that the author as a child was the first to discover her body. ‘On Self-Knowledge’ – about the loss and eventual recovery of a ring – ends up being an examination of his immediate tendency to accept any loss. One of the longer pieces, ‘On Trust’, is among other things a most vivid account of a visit to China and an experience of the place that tourists would not normally see. In common with Monty Python’s Spanish Inquisition, then, Sant’s main weapon is surprise, an apparently serendipitous range of directions and indirections that end up gaining meaning from their being together. It seems there is an increasing tendency now to view everything we write as having an element of autobiography about it – even reviews, never mind essays, qualify in that they are testimony to what one was reading back when – and so it’s perhaps no surprise that the openly autobiographical pieces are among the most arresting here.